My food blogging friend Jane, from Fromage Homage, came to visit recently for a tour of various cheesy venues in Suffolk. 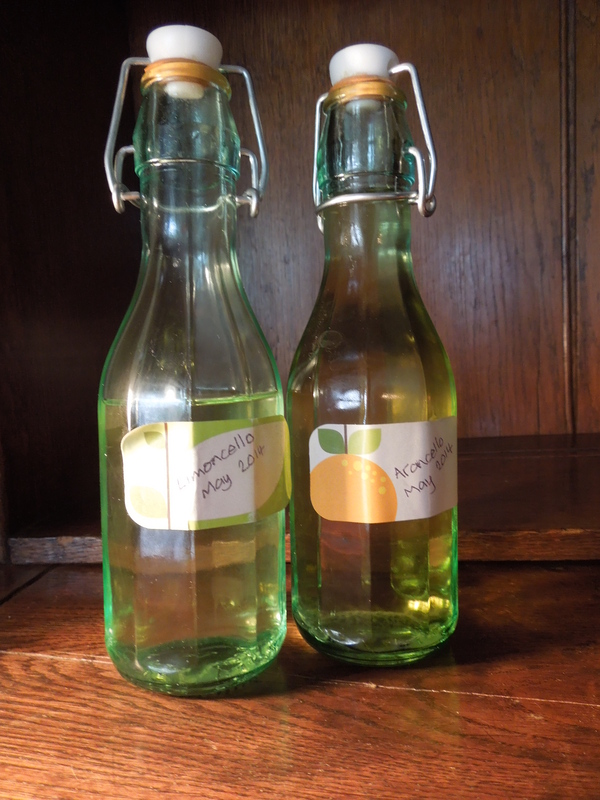 Although she writes about British cheeses, her foodie interests are wide-ranging and she gave us a very welcome present of home-made limoncello and arancello, the lemon- and orange-flavoured Italian liqueurs. Cleaning the floor is not my favourite occupation but my ice cream eating is of Olympic standard, so the outcome was a no-brainer. This ice cream recipe and the method for still freezing (below) come from Ice Creams, Sorbets & Gelati: The Definitive Guide, by Caroline Liddell and Robin Weir, one of many excellent cookery books from independent publishers Grub Street and highly recommended. Prepare your ice cream machine – or if you don’t have one, follow the directions below the recipe*. 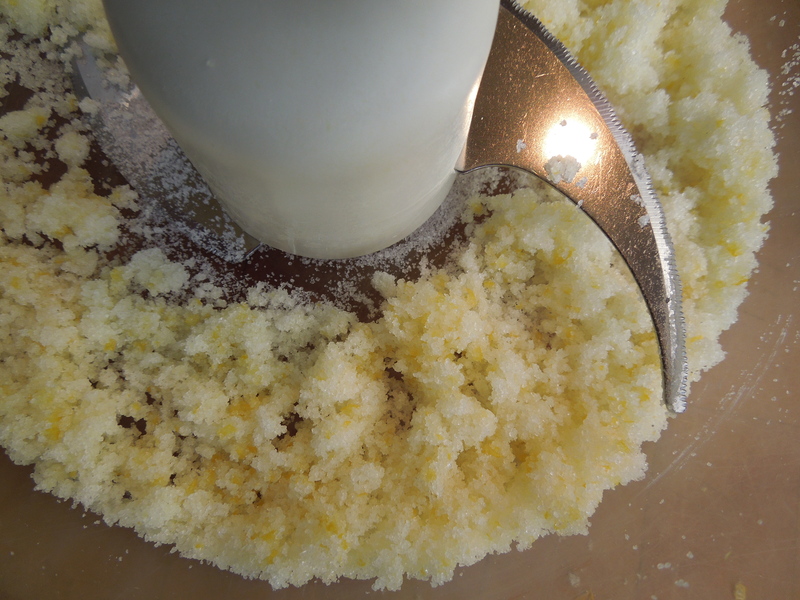 Using a potato peeler, peel three strips from one of the lemons from top to bottom, about 1.25 cm wide. 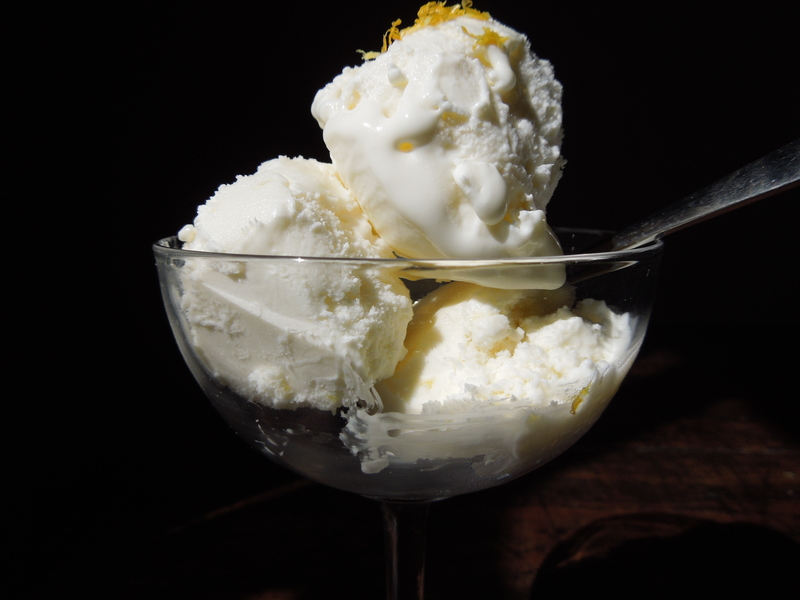 Using a sharp knife, remove any white pith adhering to the strips, otherwise it could make the ice cream bitter. 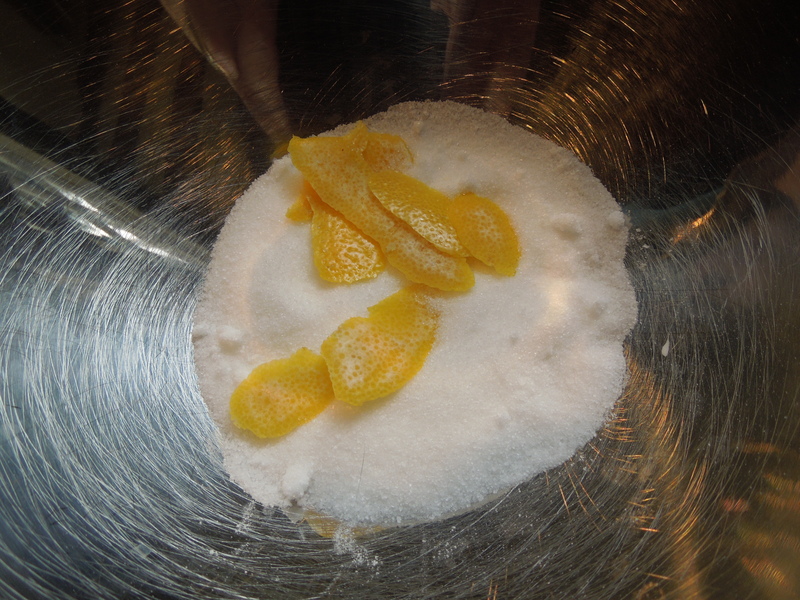 Put the lemon peel and sugar in a food process and whizz until the peel has dissolved into the sugar. 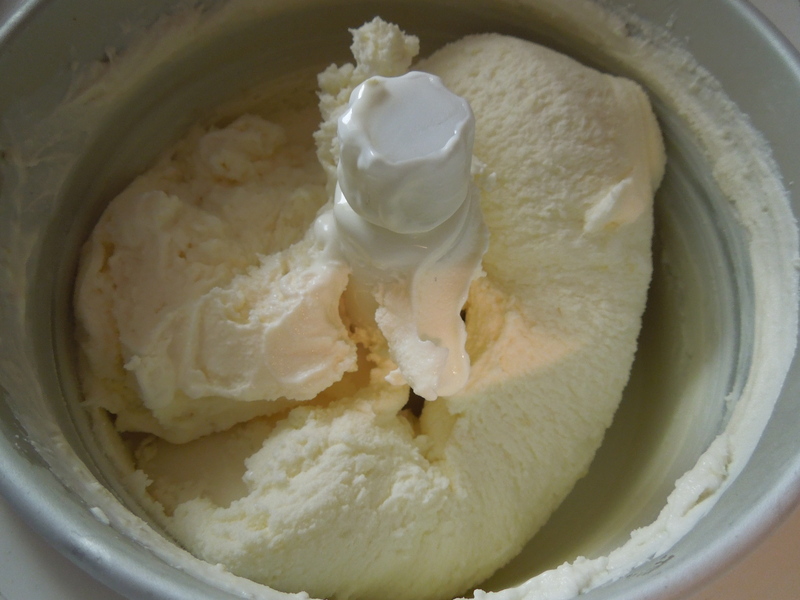 Add the cream and yoghurt and process briefly until everything is well mixed then freeze in your ice cream machine until it has the texture of softly-whipped cream. Scrape into a lidded plastic freezer box, cover with greaseproof paper and freeze for a couple of hours. If it’s frozen solid, put it in the fridge to soften a good 20 minutes before you want to eat. 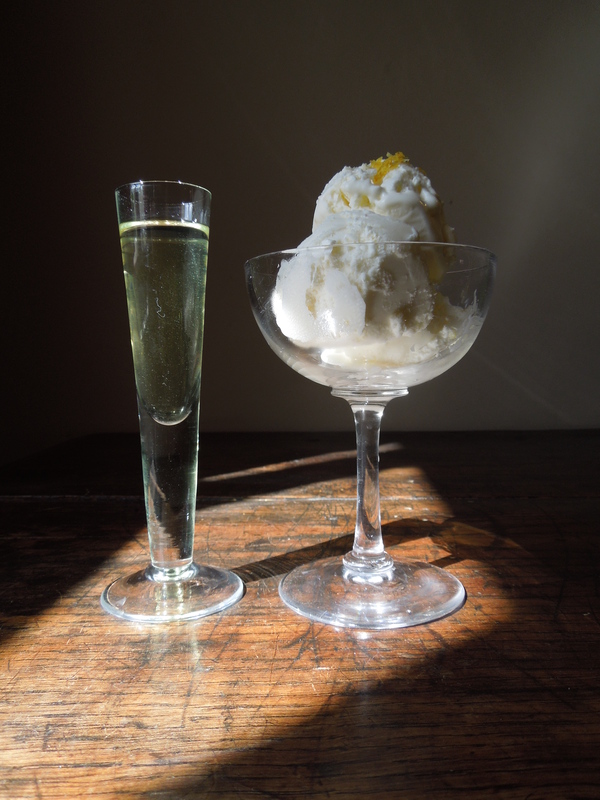 Scoop into sundae dishes or glasses, top with a little grated lemon peel and serve limoncello in shot glasses for your guests to pour over the top. Pour the mixture into a large, strong plastic box, cover with a lid and put it into the coldest part of your freezer. Check after 1-1 1/2 hours, by which time the mix should be icy around the sides and base of the box, with a slushy middle. Now either beat it in the box with an electric hand mixer or put it back into the food processor and slush it up. Put the box back into the freezer and repeat the beating process at least twice more at 1-1 1/2 hour intervals. Finally, put it back in the freezer for 30-60 minutes until it’s firm enough to serve. This entry was posted in Desserts, cakes and biscuits, Eggs and dairy, Fruit and tagged ices, lemon ice cream, lemon yoghurt ice cream, limoncello, yoghurt ice cream by Linda Duffin. Bookmark the permalink. Thank you on all counts though of course credit for the booze must go to Jane. Yes, I’m thinking arancello might be nice too poured over an orange polenta cake – if it lasts that long. Excellent post. The photos are lovely. Is that my old school desk in there? Thanks, Conor, but no, not unless you went to school in our hall. I think you’re probably referring to the chest our cat was sick on. Plays havoc with the polish. So glad you could put it to such a delicious use. If I wasn’t on a post-holiday enforced diet of cabbage gruel and crusts, I’d be tempted to make some 😉 Thanks again for a great trip. Apologies for the belated reply but thanks again and hope you’re now on to more fattening foods again (cheese? ).